Bejeweled Blitz Live is the latest Popcap title to hit the scene, though some might make the argument that it was released on PC or Facebook a long time ago. In an attempt to change up the formula a bit, PopCap has offered a handful of modes and features that take advantage of Xbox Live’s multiplayer and matchmaking. The question on everyone’s mind is whether or not these additions make it stand out from these previous versions. Local Multiplayer – While the head to head mode doesn’t have each player affect the other’s gameplay in any way, opening the floor for discussion of one’s split-second triumphs and failures while comparing scores after the dust settles can keep players busy for far longer than one might think. 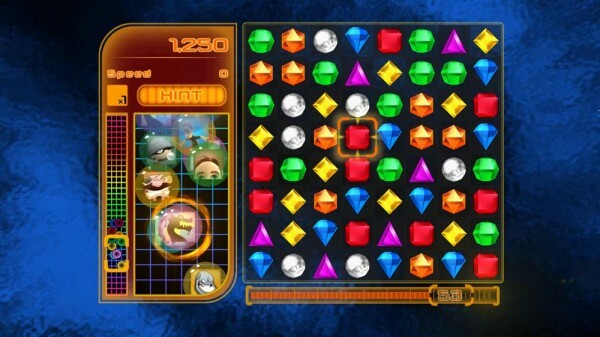 Controls – PopCap chose to adjust the control scheme for this version of Bejeweled Blitz to better suit a controller interface. Instead of the rectangular box which signifies two gems to be switched (as is the case in the PC version), the player instead moves around a cursor which highlights single gems. The face buttons then control the direction the gem is to be swapped; Y switches the gem with the immediate upward neighbor, B switches it with the gem to the immediate right, and so on. While this interface isn’t immediately intuitive, it seems to make the analog stick + buttons combo more forgiving, allowing one extra movement in any direction as a margin of error. “Classic” and “Twist” Modes – The name of this game suggests that it’s limited only to the one-minute variant of Bejeweled which shares the same name (sans the LIVE) on Facebook. However, that is only one of two playable modes in Bejeweled Blitz Live, the second being “Twist” mode. This variant was also present in Bejeweled Twist on PC and mixes up the formula a bit. Instead of switching two gems in a single move, the player highlights a group of four gems and rotates the group to match gems in rows. 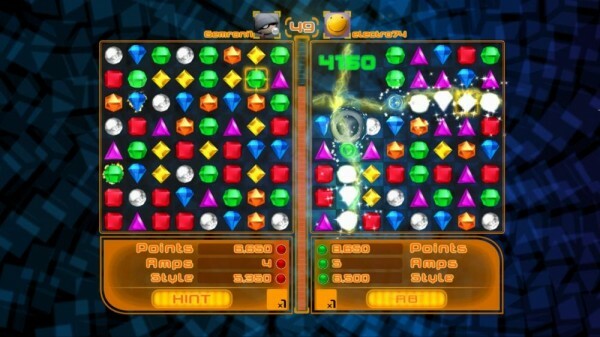 This style of play might feel foreign to a fan of the vanilla Bejeweled, but it does allow for a little bit of variety to break up the otherwise completely repetitive gameplay. Xbox Live Party Mode – Unlike local multiplayer mode, Xbox Live Party Mode is entirely dependent on either the geniality of randomly matched players with or whatever group of friends are available at any given time. 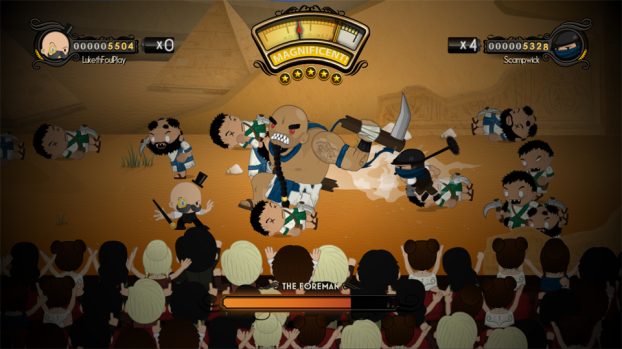 The gameplay doesn’t change at all, with the only notable addition being a small window on the left side of the screen that visually compares the scores of all the party members. The lack of any player-to-player interaction outside this score comparison coupled with disjointed voice chat makes party mode quite boring. Lack of Facebook Integration – Perhaps the best feature of Bejeweled Blitz on Facebook is the ability to compare scores with friends and feel a sense of competition from the sheer amount of scores on the leaderboard. This new version of XBLA is missing that feature from the start, lacking the huge userbase of Facebook and making this score comparison all but missing if the game doesn’t gain traction quickly. The business model of XBLA obviously doesn’t allow PopCap to pass out BBL for free, but this problem could otherwise be solved by simple shared leaderboard between the two services. Instead, Bejeweled Blitz Live’s premier feature will likely be the one most out of reach for a majority of players. Bejeweled Blitz Live falls short due to the simple fact that XBLA can’t allow it to hit the same critical mass as its primary competitor – Bejeweled Blitz on Facebook. While PopCap has made some steps to differentiate this game from its popular free competitor, most of them fall short due to their appearance in other PC versions of Bejeweled. Xbox Live Party mode is clearly the most original way to play this game, though it ultimately adds up to little more than 16 people playing the game while in a voice chat session. The best way to play Bejeweled Blitz Live is with a buddy on the couch. The quick 0ne-minute games allow for short sessions between other activities and the scorekeeping allows for last second victories and failures by the bushel. In any case, it seems clear that this game will appeal most to people who haven’t had much experience with Bejeweled and can appreciate oft tread mechanics familiar to series veterans.